Heat the coconut oil on medium heat in medium sized pot (with high rim). Peel garlic cloves, cut the onion and celery stalks into small cubes, finely chop ginger and garlic. Give all into the pot. Crack the cardamom pods open and add them along with cayenne pepper and let the spices steam with the lit closed on low heat. Wash the carrots and sweet potatoes thoroughly and cut them into small cubes, (about 1cm max). Bring the water to boil in your kettle (This saves a lot of time) and add the cubes to the spices in your pot. Steam everything together for a few minutes, then add the hot water and half of the coconut milk, as well as the sage, sea salt and pepper. Leave to boil for 20 minutes. Toast some sunflower seeds in a pan without adding oil. Keep on moving them to avoid burning. Once they are slightly golden-brown, put them aside in a bowl. Then do the same with shredded coconut. Blend the soup with an immersion blender or in your blender, if you have a big one. Add the second half of coconut milk and more salt or pepper according to your taste. 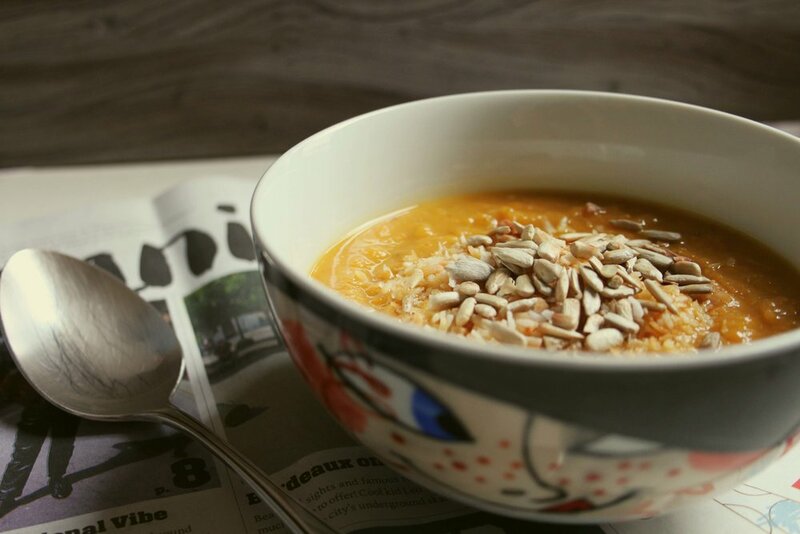 Serve the soup in bowls and top it with toasted sunflower seeds and coconut shreds. This soup is packed with whole foods that all bring their own goodness to the table. I chose to cover a few highlights in the following. Sweet potatoes stabilize blood sugar levels and support the body’s response to insulin. They contain high amounts of antioxidants and vitamin C, as well as vitamin B6 and beta carotenes, the precursor to vitamin A. This makes them a healthy option to include in your dishes in times of high stress. Energetically, sweet potatoes are a grounding food and their nutrient density serves as an ideal immune system support when the seasons change. Sage is a member of the mint family and has antimicrobial properties. No surprise its latin name “Salvia officinalis” translates to “the savior”! It is said to have blood sugar lowering effects and anti-inflammatory properties. Moreover, sage provides us with high amounts of antioxidants. In consequence, this herb is a perfect little helper whenever you’re dealing with stress or a cold (or both). Cardamom is one of my favorite spices. Among many health benefits, It may lower blood pressure, decrease inflammation and has served as a digestive aid against nausea, vomiting, and discomfort for thousands of years. Moreover, the spice of Indian origin might decrease anxiety and enhance the use of oxygen. The name Cayenne is derived from the word “kyinha” which means pepper in the old language of the indigenous Tupi people in Brazil. Cayenne is a member of the nightshade family and cayenne pepper is the dried powder of the capsicum. Energetically, it has warming properties that stimulate digestion and circulation. Therefore, it can clear congestion and even act to relieve pain. If you are the cold hands and cold feet kind of person, this is your spice! It is also a great support for your immune system, as it is packed with the antioxidant vitamins A, C, and E.